We sat down with Ecotrust Vice President Bettina von Hagen to discuss the environment in which Ecotrust operates, changes in the forestry sector, and Ecotrust's vision for a "reliably prosperous" future. Ecotrust is focused on the geography of Salmon Nation — from Alaska to California, which features some of the most productive natural resources in the world and which has sustained native populations well for millennia. Yet when we look at the natural resource sectors — from forests, to farming, to fisheries — we see a pattern of declining natural, social, and financial capital. None of those industries are serving the land or the people as well as they might be. From an ecological perspective we’re seeing effects like dwindling fisheries, declines in water and air quality, declines in habitat, and increasingly degraded landscapes. From a social perspective, we think about the number of people employed in those sectors and the quality of those job experiences. From a financial perspective, we might look, for example, at the timber sector, where the industry has been underperforming — by Wall Street standards — for twenty years and where you have lands changing hands at an increasing pace, an increasing number of bankruptcies, and new financial mechanisms — which are, in fact, merely short-term fixes — being created to solve the problem. By any criterion — ecological, social, or financial — there has not been a pattern of real value creation in these industries. So the question that Ecotrust is trying to address is: how do you build a restorative economy, in the region, where every transaction — on 100 percent of the landscape — enriches people and place. 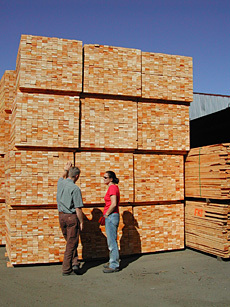 In forestry, the social context is that the number of jobs in the woods is declining; that the average age of forest operators is increasing; that the environment is very competitive, with increased price pressure on the remaining contractors; that opportunities for employment in the valued-added sector are declining; and that mills are located closer to the I-5 corridor and are more automated, offering fewer jobs. We think that the industry is making a wrong decision in responding to global pressure by trying to compete on price, on a commodity basis, with regions that have lower wage costs and that can grow wood more quickly. A more appropriate response would be to develop a style of forestry — and farming and fisheries management — that produces economic, ecological, and social benefits that are unique to the inherent productivity of this ecosystem. The forest products industry is now seeing both a consolidation and a fragmentation. If you look at the number of integrated companies that were operating in the region, the list goes from a hundred companies, to tens of companies, and today, you can basically count them on two hands. At the same time, there are new ownership patterns, where — on a national level — half of the forestland that was owned by integrated forest products companies has transferred to ownership in which the forestland is managed in a fund on a ten- to fifteen-year time horizon, for the benefit of its investors, and the metric is solely to maximize the financial value of that investment. It’s a big difference from the old owners who — whatever you might say about their management practices — were forest lovers and wanted to maintain the forestland as forest. One of the trends happening now is that billions and billions of dollars are flooding into forestland investment as an asset class, so the question becomes: how you capture that infusion of new capital for the benefit of people and place. At the same time, there are other trends, such as the rise in social investing and the interest and potential development of ecosystems markets. This environment presents an opportunity for those, like Ecotrust, who want to develop a full array of forest products and services. Over the last two years, we have developed Ecotrust Forests, LLC as a mechanism to acquire and manage forestlands. We believe that our forestry practices will be more profitable than industrial forestry and that a transparent example of ecological forestland management will demonstrate better effects on the land, will potentially provide up to twice the level of employment, and ultimately with the development of new markets, can provide superior financial returns at lower risk. When you manage forestlands for an array of products and services, you always retain your options on the land: removing inventory when prices are highest, maintaining an array of species and age classes, providing recreation, scenic views, and non-timber forest products. The reality is that we’re buying industrial forest that’s been intensively managed and converting it back to a forest that is more representative of the structural diversity, age-class diversity, and species distribution that you would find there initially. Basically there have been waves of diminutions in natural capital — from old growth, to a 60-year old forest, to a 35-year old forest. In the modeling of ecological forestry that we and others have done, we see that once a forest is restored a to a desired structural complexity, species diversity and so on — a process that can take 10 or 20 years — it starts producing more timber and more value than an industrial forest. In terms of a financial comparison, if you look at Net Present Value, your returns depend on your discount rate. If you look at a very low discount rate, then ecological forestry performs better. With the rates that are used in the industry — six, or seven, or eight percent — industrial forestry performs better because it prefers cash flows that are nearer in time. Markets for ecosystems services would monetize financial returns from the inherent public values of these forestlands. In our analysis, for example, by shifting from a 45-year average rotation to a 65-year average rotation, a market for carbon valued at $5 a ton would make up the difference in the two Net Present Values at, I think, about a 6 percent discount rate. So when you start including all those ecosystem service values, then ecological forestry seriously outperforms industrial forestry. Basically, industrial forest management runs like this: replant, manage intensively, control competing vegetation with herbicides, possibly fertilize as well, do pre-commercial forest thinning at age 15. With forest rotation ages now often below 40 years, there is frequently no commercial thinning. With ecological forestry, we’re looking at enrichment planting — if we need to support the natural regeneration — no herbicides, a pre-commercial thinning at age 15, and a thinning every 15 to 20 years thereafter. On the [Ecotrust Forests, LLC] Dickey River property, we’re looking at an average rotation age of 65 years, but we’re also considering another 10 percent of the property as a late successional reserve, of 130 years plus. In all, there’s more activity and more valuable activity occurring on the land. What creates value is using more labor to produce a higher value product — higher grade logs. It’s more careful forestry, slower and more deliberate, and we think it requires more intelligent and experienced planning and operation than industrial forestry does. In the forestry sector, a certification system evolved 14 or 15 years ago, called Forest Stewardship Council (FSC) certification, which includes a set of global principles and regional standards that define good forestry from social, ecological and financial perspectives. Landowners that are seeking some returns and incentives for good practices have adopted FSC. Taking advantage of the boom in green building that offers a preferential demand for FSC products, Ecotrust’s Forestry Market Connections program strives to facilitate market access for landowners and distributors of FSC-certified lumber. In Sweden and other countries, the forest products industry has embraced FSC. In this country, the industry has chosen not to. They’ve retreated to the usual stance of conflict between industry and environmental groups, and part of Ecotrust’s approach is to break down that dynamic. We believe that ecological forest management is in the best interests of the forests products industry. The development of ecosystem markets, the development of additional revenue streams, and the development of a unique niche in a competitive world market all serve the industry well. So part of our approach is to help entice, encourage, cajole, reassure the forest products industry that this approach is viable and helpful. At the end of the day, without the support of key players in the forest products industry, we’re not going to be able to change the way the industry is managed. That approach is at the root of the work of Ecotrust Forests, LLC as well as of Ecotrust in general. We are working to learn to live in this wonderful geography in a way that truly produces value for its current and future citizens. So that every activity — from forestry, to farming, to building cities, to civic governance, to urban planning, to producing power, to making widgets — builds social, ecological, and financial capital.